ITF NOLA’s Gray Division teams before Tribal Wars started. This weekend I competed in my first-ever fitness competition. If you’ve been reading this blog for awhile, you’ll have seen me talk about joining a gym called Iron Tribe Fitness. I’ve never been to a crossfit gym, but I hear that the two are very similar, but technically they’re both their own brands. So I’m not a crossfitter, I’m an ITF athlete…which suits me just fine. I go to the gym four or five days a week, unless I’m traveling or sick. The workouts are 45 minutes long, and consist of a warm up, cool down, and about 35 minutes of HIIT training / weight lifting. Every day is something different, so you never get bored. The coaches are really hands on, and there’s a real camaraderie between coaches and athletes. Everyone’s very supportive, no matter your fitness level, and over the course of the last nine months I’ve ended up making both gym friends (folks that I chat with on site), and real life friends (people that I hang out with outside of gym-related activities). When I started at ITF, I had no clue how deeply my life would be affected, but I wouldn’t have it any other way. I’ve grown to adore my coaches and the people I work out with, and genuinely look forward to that precious time each day when I get to just go and work up a good sweat with people who not only don’t judge me, but also help me forget to judge myself for awhile. To put it mildly, it’s a great feeling. Even with all of the above being said, I was still very nervous to sign up for Tribal Wars, the annual Iron Tribe competition. The event is for teams of four, competing in one of three divisions: Gray (lowest weight and reps), Orange (more weight and reps), and Black (lots of weight and reps, ie. superhuman effort). Our workouts at the gym are color coded, as well, and I’m typically working out in the Gray range, so I knew that I’d be competing in Gray as well. Easy. But none of my regular gym friends were competing, so I didn’t know how to tackle that. Luckily, the coaches were really helpful on that level, and set me up in a team with three other people I hadn’t met before in class, but ended up really liking. Last Friday I hitched a ride up to Birmingham, AL with Lauren, another girl from the gym that I’d said hi to on occasion but didn’t know that well. As it turned out, she ended up being awesome, and we talked non-stop on the five-hour trip from Louisiana to Alabama. We were also in the same hotel room as our female coach, Shelby, which ended up being a great arrangement, since our personalities meshed really well. We all crashed pretty early, then woke up at 5:30 the next morning to make it to the stadium for Tribal Wars by 6:30. My team had had a hard time getting together prior to the competition, so that morning was the first time we were all in one place. We talked strategy, sat through a “how to” session where the event judges ran us through what constituted a rep or a no-rep (that means that you’ve done something incorrectly and that rep won’t count), and got ready to rumble. My team after the competition. 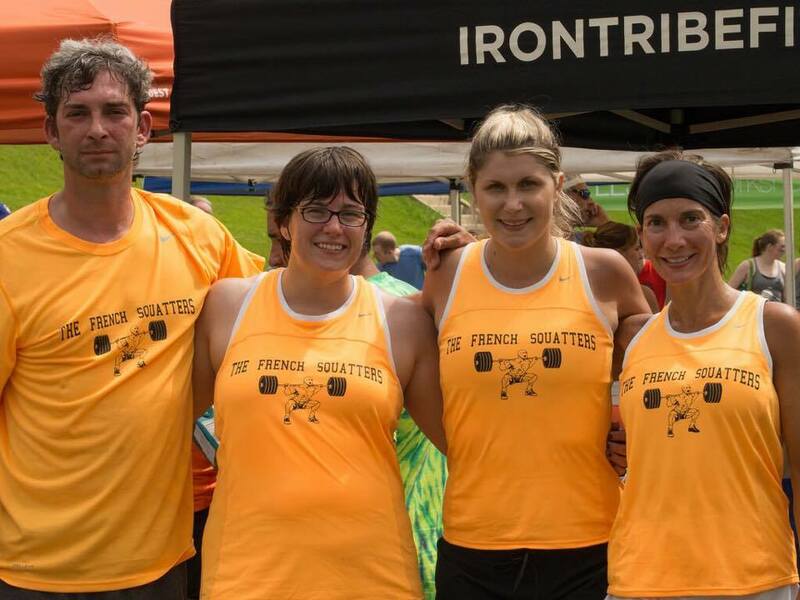 My team was named The French Squatters, which was meant to be a pun on French Quarter and the numerous weightlifting exercises that involve squatting. It was funny enough, and none of us really cared that much about the name, but there were some truly funny/clever ones out on the field. I loved The Chalking Dead (where the logo had a chalk handprint), and Double Stuffed (their logo was a kettlebell that looked like an Oreo cookie), but my favorite one was 2 Jerks & 2 Snatches. There was also a team that wore Teenage Mutant Ninja Turtles t-shirts. Can’t remember their actual team name, but they wore cool uniforms. Really looking forward to next year’s team name/uniforms. I’d love to put together an all-girl team named The Power Snatches! Each division had three workouts overall. I didn’t pay attention to how the workouts were being scored, but there were several different things that were being calculated, involving weights and times, and a certain number of reps were required in each workout. 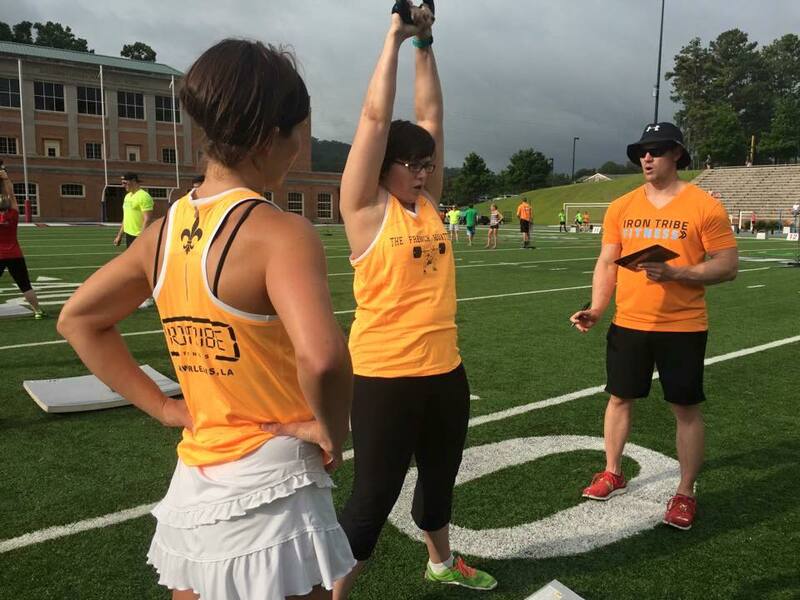 The event took place on a college football field, and each team had an aisle to work out in. I don’t know much about how football fields are marked, but the aisle was the area between the horizontal lines that mark the field. Yard lines? Not sure, and not taking the time to look it up. Doing kettlebell swings in Workout #1. Anyway, Workout #1 for Gray Division sent two people to one end of the aisle, and the other two people to the other end. At one end, the two people had to do 100 barbell cleans (55 lbs) and 100 box jumps. At the other end, the other two people had 300 single unders (jump rope) and 100 kettlebell swings (26 lbs). After both sides had completed all assigned activity, all four team members met up in the middle for 15 team barbell burpees, where all four people had to do a burpee and jump over the equivalent of a barbell, then all four would do a burpee on that side, then jump, then burpee, etc, back and forth. All team members had to jump and land with both feet off the ground, or it would be a no rep and the whole team would have to repeat that burpee. I was most worried about the burpees for this workout. My teammate Olga and I were on the jump rope / kettlebell side, and didn’t have much problem taking care of them. I tripped a couple of times on the jump rope, which I honestly didn’t expect because I’m typically pretty quick at single unders, but she picked up when I faltered, and I did my fair share of kettlebell swings to help her out. I was surprised to really love those, by the way. I keep finding exercises that I used to be afraid of, and now really like. What surprised me most is that even though I was afraid that I’d be really slow and hold my team up on the burpees, we were all about the same level of proficiency, and I was even faster at some points. That surprised me a lot. Workout #2 was a 300 meter shuttle run where the first team member ran up and down the field, then as soon as the first person got back, the second person and the first person could go again, then as soon as the second person got back, the first, second and third people could go, etc. As soon as the first person was done with the run (3 trips across and back the short side of the football field), they could go to the sidelines where there was a rack set up with a barbell and weights. All team members then had the remainder of the time for that workout (I think it was 15 minutes overall) to reach their heaviest weight for a complex of 3 front squats and an overhead of each person’s choice. I was a little bit disappointed on this workout, to be honest. My shuttle run was a lot faster than I’d thought it would be, but in the end there wasn’t enough time to get to my heaviest front squats / overhead combo. 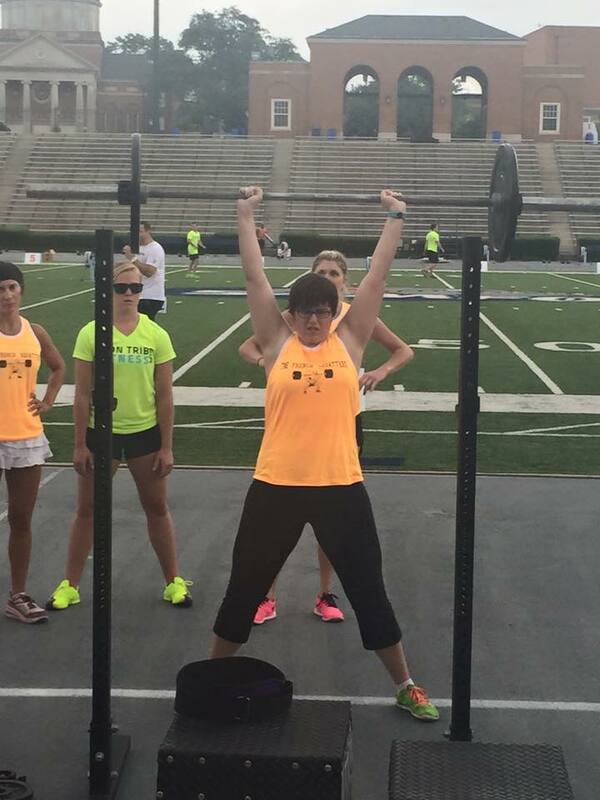 My PR with an overhead up until that point was 75 lbs, but that day I knew I had more in me. Since we were working our way up to adding more weight as a team, there just wasn’t enough time on the clock to adding any more weight, and my final weight was the same as my existing PR. I honestly think I could have done at least 85 lbs, but that day I was planning on trying for 95 lbs. Oh well – that gives me something to try for in the coming weeks. One great thing about the front squats is that I wasn’t very confident that my squat was low enough, and I was afraid of getting a no rep. I’ve historically had a lot of hip and back pain, and though squats have really been helping me get rid of the tightness in my hips, I still was worrying all the way up to the competition. 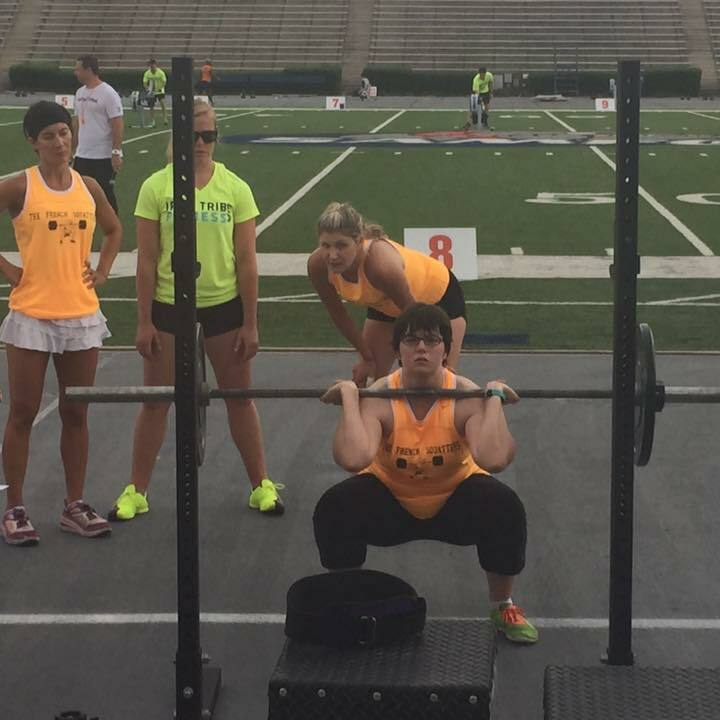 While I was working out, Lauren took some photos of me from the stands – and look at this awesome front squat! I don’t look beautiful in this pic, but I look strong, and I’m very proud of it. I finally get low enough in my front squat!!! My feet are too far apart, I’m making THE WORST expression, and I could have put more weight over my head. But this is me holding up 75 lbs overhead, when 9 months ago I struggled with just putting a 35 lbs bar up there, so I’m sharing it for posterity. The first two workouts had been common knowledge for a few weeks before the competition, but the final workout was kept a mystery until that day. We had to do weighted forwards and backwards lunges with 2 kettlebells (26 lbs for girls, 35 lbs for guys), a 250 meter row on a rowing machine, and 100 push presses as a team (55 lbs for girls, 75 lbs for guys). The hitch was that the first person would do the lunges, run to the rowing machine, and as soon as they got strapped into the rowing machine, the next person would pick up their kettlebells and stand with them (no lunges) until the row was complete. At that point, the rower would run to the push press station and start working on push presses, and the lunger would start doing lunges, then move on to the rower. The person doing lunges could never start doing them until the rower was done, and if at any point the person put down their kettlebells the rower had to stop rowing until the kettlebells were back in hand. After all of the team members were done with lunges, rowing, and all 100 push presses, then they had to do this weird exercise called a mudskipper (after a fish native to the region that walks on land). One team member puts their toes on a frisbee, gets into what basically turns out to be the plank position, and uses their hands to walk across the football field and drag their feet behind them. The best strategy that we saw for this was to do more of an inchworm move, where instead of making the back half of your body deadweight, you bring your knees towards your chest, walk hands forward, scoot knees to chest, walk hands forward, etc. It covered a lot more ground more quickly, and was a great ab workout. The Gray Division teams after competing, sweaty and happy. In the end, my team didn’t win. We finished 45th out of 47 teams. But to my surprise, I wasn’t disappointed at all. We worked REALLY HARD. It was a great workout. We finished everything we started out to do, and never gave up. For a team where only one of us had competed in Tribal Wars before, we did a damn good job. 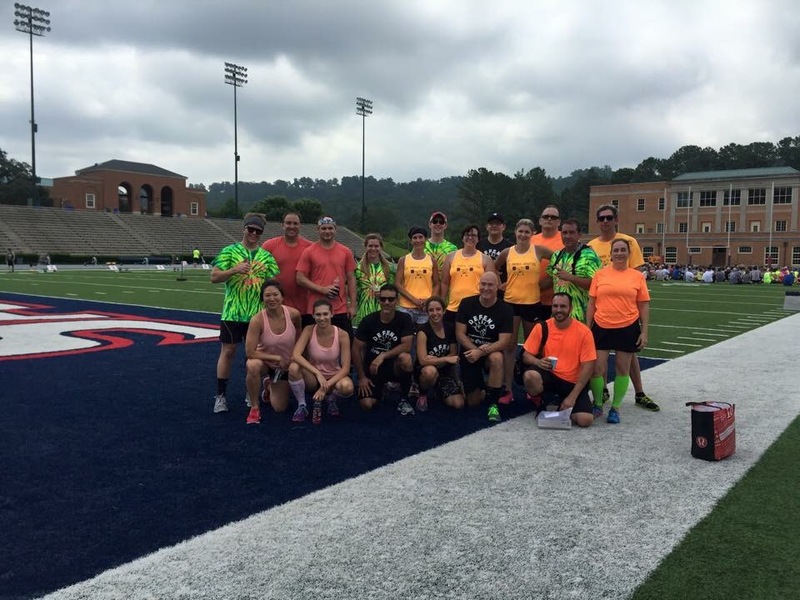 What was even more surprising for me is that after the competition was over, after we all got together on Saturday night to take over the hotel bar, and after the biggest Cracker Barrel breakfast the next morning, all the way home I couldn’t help but plan for how I’d be better next year. I walked into Tribal Wars feeling pretty apprehensive, not sure that I’d even make it through the workouts, almost certain that I was bound to disappoint my teammates and make a fool of myself. I left Birmingham feeling awesome. I’d made new friends, completed a really hard workout, and had complete faith that I could do it again – better – next year. It also gave me the idea to start thinking of every workout between now and the next Tribal Wars as competition training. It’s entirely possible to get much, much stronger between now and then, and I’m going to do it. 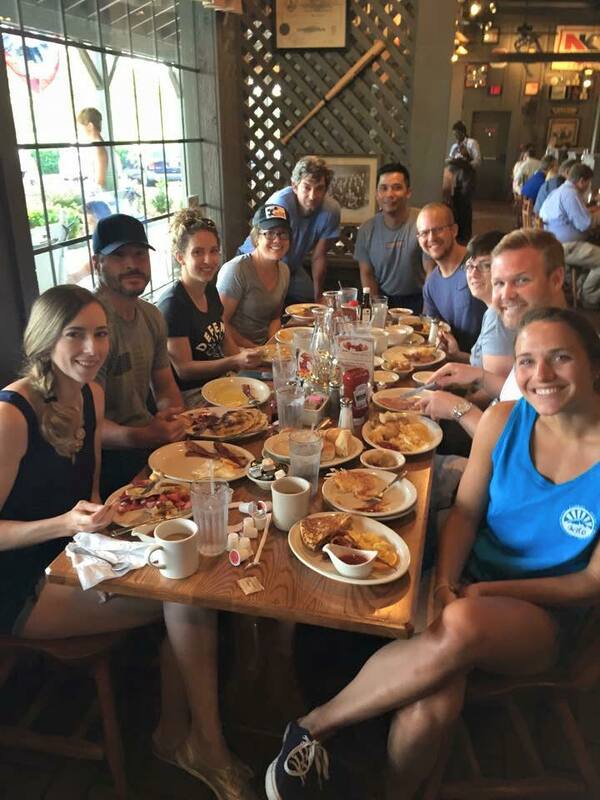 Breakfast at Cracker Barrel on Sunday – we had so many plates that we were running out of room on the table! Overall, I’m really grateful to my Iron Tribe friends and family for being there. I have a lot of issues with my body. I was never confident about my physical appearance to begin with, but gaining so much weight over the last couple of years has been an enormous strain on me. 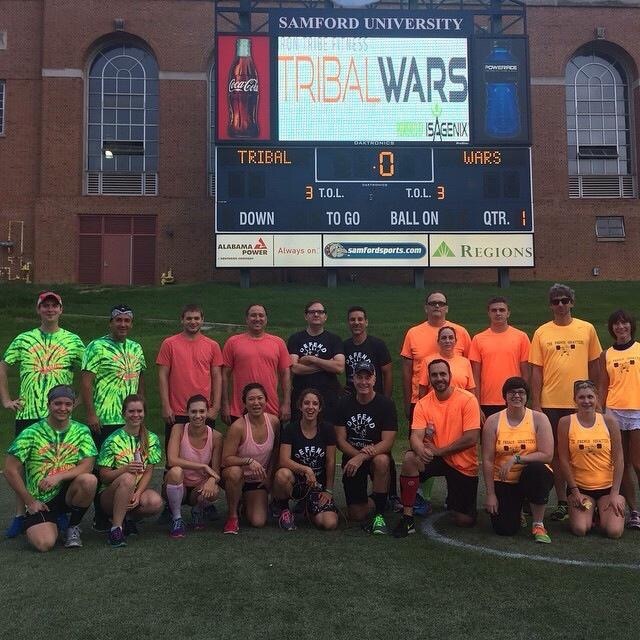 I feel like Tribal Wars helped punch a big ol’ hole in those clouds of doubt. Yes, I’m aware that my body doesn’t look how I’d look in an ideal world. But I’m happy to trade out those worries for the time being, and to instead concentrate on how powerful and capable my body is. I’m so strong, and only getting stronger. I’m totally OK with that.